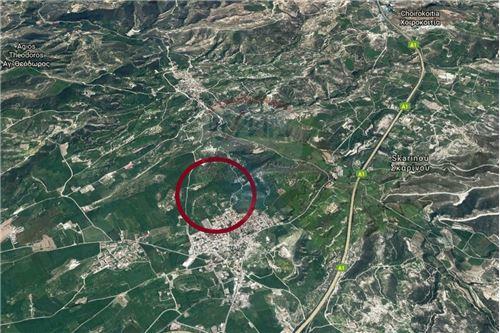 This property is located between Larnaca and Limassol, in the beautiful village of Skarinou with a total area of 18004m². The land contains 250 olive trees, 120 orange and citrus trees, as well as 2 vineyards of 20 metres each. The asset, as a land, has a rather irregular rectangular shape with a total frontage of 219.69 meters. It is only 15 minute drive to the sea, a 20 minute drive to the centre of Larnaka or Limassol and also provides easy access to the highway for trips to Nicosia, Paphos or Ayia Napa. The property falls within planning zone Z1 with 6% building density, 6% coverage, 2 floors and a maximum height of 8.3m. This property is located between Larnaca and Limassol, in the beautiful village of Skarinou with a total area of 18004m². The land contains 250 olive trees, 120 orange and citrus trees, as well as 2 vineyards of 20 metres each. The asset, as a land, has a rather irregular rectangular shape with a total frontage of 219.69 meters. It is only 15 minute drive to the sea, a 20 minute drive to the centre of Larnaka or Limassol and also provides easy access to the highway for trips to Nicosia, Paphos or Ayia Napa. The property falls within planning zone Z1 with 6% building density, 6% coverage, 2 floors and a maximum height of 8.3m.